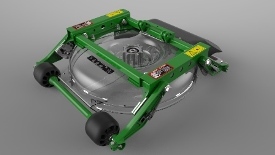 The 9009A TerrainCut Rough Mower is equipped with five and the 7400A TerrainCut Trim and Surrounds mower is equipped with three 27-in. (68.6-cm) stamped rotary decks for superior productivity and strength. The rotary decks perform exceptionally well across a wide range of grass types, including warm- and cool-season grasses. A strong stamped, 10-gauge shell construction is an integral part of this durable deck. The stamped design uses a single piece of steel to form the shell that provides consistent strength throughout all areas of the deck. This is the starting point of the strength and durability of the deck construction. Surrounding the deck is a tough, steel frame designed to protect the deck shell. It all starts with the frame on top of the deck which is then bolted to the shell providing extra protection. The front and rear roller brackets are attached to the framework, so as the front and rear rollers encounter obstacles, the force is transferred through the frame rather than through the deck shell. This design also decreases the distance from the blade tip to outside edge of the deck for closer trimming around objects like trees and fences. 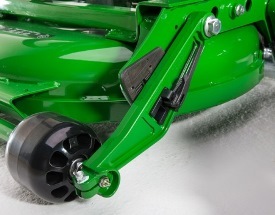 An angled skid plate between the front roller and deck shell helps protect the front lip of the deck from tough terrain such as tree roots or other objects. 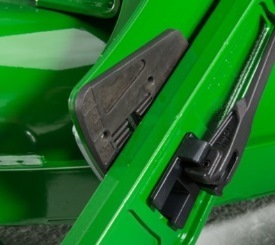 The skid plate helps move the deck over the object to prevent the front edge from contacting and damaging the deck shell. The side of the deck also has additional protection to increase durability with a 1.5-in. (38-mm) tall and 0.5-in. (12.7-mm) thick steel stock welded to the decks edge. Roller brackets are cast steel with extended housings to effectively protect the roller bearings from a wide range of debris types. The large front rollers are greaseable to help purge water and debris and use snap rings to ensure bearings stay in place, increasing durability and longevity of the front rollers. 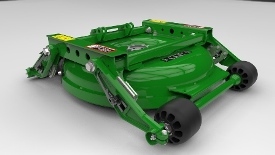 The 9009A and 7400A TerrainCut™ Mowers 27-in. 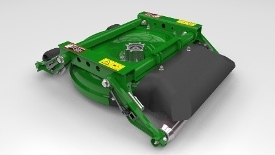 (68.6-cm) deck features a deck design with an asymmetric rear discharge cutout and molded chute to promote better airflow, leading to improved clipping dispersal and cut quality. The unique shape of the deck shell cutout includes a heavily rounded opening on one side that gradually transitions to a larger opening on the other side of the cutout, allowing the grass to exit the deck evenly while significantly reducing the possibility of the deck congestion. This design incorporates deck structure along the bottom of the discharge area that reduces sound power, does not affect cut quality negatively, and acts as a foot guard eliminating the need for an external guard that can lead to external grass build up which can be dropped in the mowing pass over time. When the asymmetric deck shell discharge shape is used in combination with the asymmetric discharge chute, this deck outperforms the competition in cut quality by minimizing clumping with smooth transitions and guiding the discharge material in a more dispersed pattern. 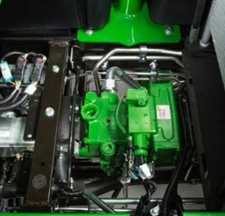 The improved dispersal will lead to less clean up and blowing, allowing machines to mow earlier in the day while saving time and reducing labor. The proper blade selection for heights of grass, grass type, and sharp blades are keys to improved cut quality and dispersal. The removal of no more than one third of the grass blade is recommended. During heavy growth times it may require changing blades, mowing more often or raising the height of cut to improve clipping dispersal. Now there is more control than ever with the TechControl display with a large easy-to-read screen. 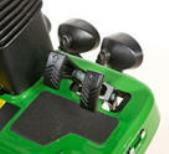 The TechControl also has a weight transfer setting for the 9009A TerrainCut™ Rough Mower. 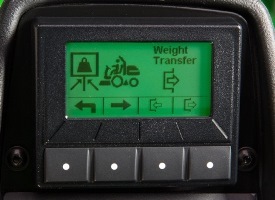 The weight transfer system allows the turf manager to customize the machine for course conditions. The weight transfer allows movement of weight from the rotary decks to the traction tires providing improved traction for hilly terrain. The system setting allows adjustment between five settings 0, 1,2,3,4. The initial setting for the weight transfer should be two as this represents the middle of the adjustment range providing excellent traction while also providing good contouring for the decks. If additional traction is needed, increasing the number adds more weight to the traction tires. If more contouring is desired, decreasing the number increases deck contouring. The 0 setting means no deck weight is being transferred to the traction tires. The drop rates of the decks can be adjusted to slower rates in soft turf conditions. This improves the ability to control the speed of the decks to the ground when lowered to ensure a premium cut quality. 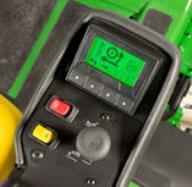 The TechControl has onboard visual diagnostics allowing quick and easy machine diagnostics, maximizing up time. 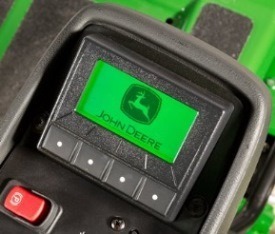 The system will allow technician to see inputs and outputs of the electrical system. Also, the technician will be able to see stored controller codes on the machine to aide in troubleshooting incidents that may have occurred while on the course. 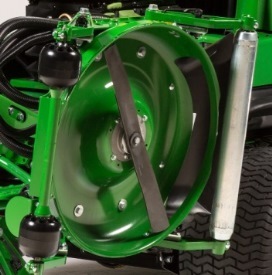 One common element among John Deere golf mowing products, reel or rotary, is that adjustments are quick and easy. 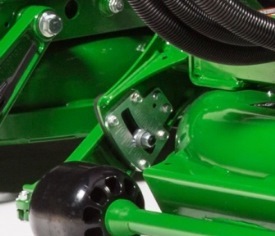 The 9009A and 7400A TerrainCut™ Mowers are no different. 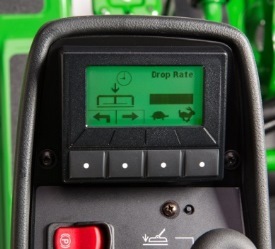 All HOC adjustments can be performed without tools with an innovative notch system, similar to what is included on the Quick-Adjust 5 and Quick-Adjust 7 reel cutting units. To adjust the HOC on the 9009A and 7400A TerrainCut, pull the levers at each end of the front and rear rollers outward. With the levers pulled out, give a quick tug to disengage the teeth in the notches. This allows the rollers to rotate upward and downward freely and easily. Locate the HOC indicator on the inside of the adjuster arm and line up the tabs or use the top edge of the adjuster arm to line up the height on the gauge located on the outside. Re-engage the notches by rotating the levers back inward to lock the HOC into place. No tools are needed to complete the adjustment. The adjustments must be performed on both the front and rear roller, and both rollers have the same adjustment process. A HOC label is also located on the rear of the deck to serve as a guide for setting the height of cut. The HOC is adjustable 3/4 in. (1.9 cm) to 4 in. (10.2 cm), in 1/4-in. (0.64-cm) increments. The HOC system has been redesigned from prior models to include a longer and stronger handle. Hardened notch material is used to improve durability and resistance to rust and debris. The 9009A TerrainCut™ Rough Mower is the lowest weight at 27 in five-gang rough mower on the market. The lower weight helps reduce the overall foot print in fine turf conditions reducing compaction and turf stress. Along with the lower weight, the 9009A features 26.5 x12-12 turf tires for low footprint and maximum traction in the toughest conditions. 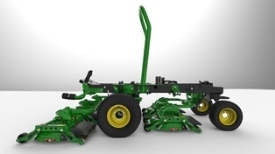 This combination provides a strong traction package with low levels of ground compaction.